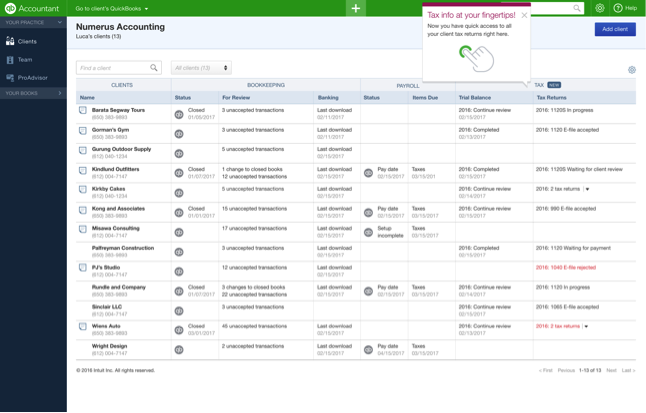 Welcome to the October QuickBooks® Online (QBO) product news, developed for you – our valued accountant partners. This month, we are testing a new, streamlined onboarding (first time) experience to enable quick setup and fast, accurate business insights for your clients. 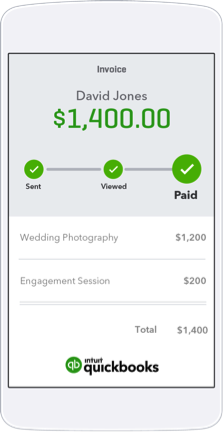 We are also launching new mobile features to simplify your clients’ business with more flexibility to access cash flow information and track invoices anywhere. 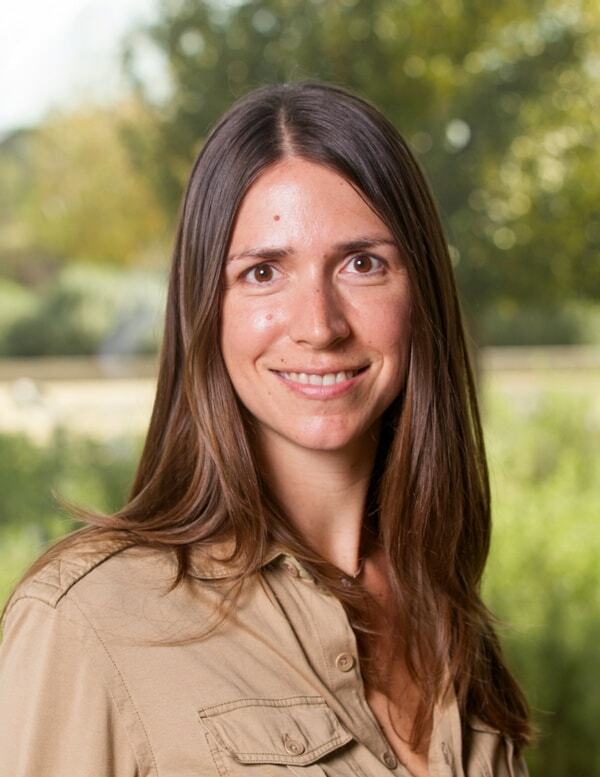 In addition, we want to give you heads up on upcoming new QuickBooks Online Accountant (QBOA) integrations with QuickBooks Self Employed and Intuit® ProConnect™ Tax Online. Faster Setup. The initial Company Setup is now easier, with fewer fields to fill out and a faster way to connect to a bank right from the setup interview. 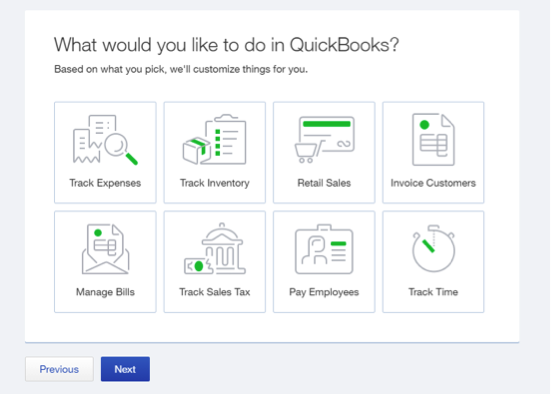 Users can personalize how they use QuickBooks by selecting which jobs are most important to them, such as Invoicing, Retail Sales or Paying Employees. Getting Started pages have been simplified, and each page on the new left navigation has a “getting started page,” if no data has been entered. 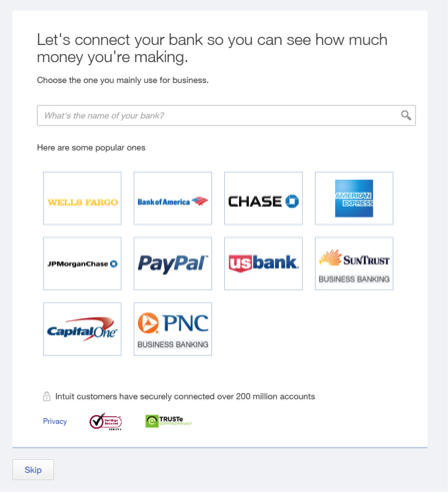 New Getting Started pages have been added for Banking, Customers, Expenses and other categories. Instant and More Accurate Profit & Loss. On the QBO homepage, the old Profit & Loss visual has been replaced with a new, more robust presentation that shows P&L as a snapshot in time. Guided Bank Feeds Categorization. Several improvements were made in bank feeds. When users click on Review Transactions in the new P&L widget, they will be taken to a new categorization first-use flow, where they will be presented with only the previous month’s transactions to categorize. In addition, multiple transactions from the same supplier or customer will be offered as a batch to either accept all or review one by one, and users can see their progress, as the Income and Expenses bars fill in as each transaction is categorized. Navigation Enhancements. 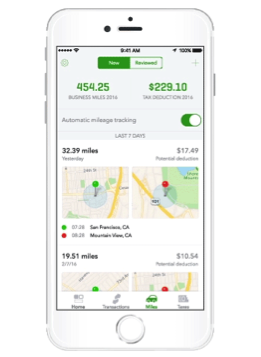 Intuit is testing substantial improvements to the left-hand navigation in QBO. Common activities are now organized under more logical Sales, Expenses, Banking and Chart of Accounts menu locations. Transaction views have been moved to simpler money-in and money-out menu centers. Sub-navigation is now managed through convenient tabs. In addition, different customers will see different navigation options, depending on how they signed up for QBO. As a result, you should check “Company Info” to see which options your clients will see. For more explanation on first-time user left navigation changes, click here. Cash Flow Insights. Your customers can now see if they are making money with a single tap. 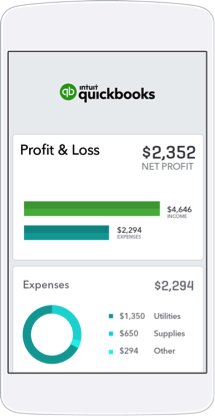 The new Cash Flow Insight seamlessly connects all accounts, so end users have an instant picture of all income and expenses. Users will recognize the value of this new feature during QBO setup, and whenever they use the P&L dashboard card. Invoice Tracking. A powerful new invoice tracking feature allows customers to instantly see if an invoice has been sent, viewed by their customer or paid. When an invoice is created, tracking information is listed at the top of the invoice screen. New data filters allow customers to search for date-oriented billing expenses that are related to an invoice. A convenient activity feed lets users check the status of all recent invoices. Accounting and tax professionals have asked us for seamless integration between QuickBooks Online Accountant (QBOA) and two other Intuit products, ProConnect Tax Online (PTO) and QuickBooks Self Employed (QBSE), transforming the QBOA platform into a central hub where accounting professionals can access and manage all their clients’ data from one dashboard. Coming Soon: ProConnect Tax Online. Want to combine all of your client accounting and tax work into a single, easy-to-use system? Intuit’s cloud-based PTO is the only professional tax software that will integrate with QBOA. As a result, you can access files from a single dashboard, get e-file and other status alerts, and export tax-ready data with a single click. PTO speeds and simplifies tax preparation, and helps you catch potential tax issues early. ProAdvisors receive seven free tax returns (five 1040 returns, which includes Schedule C and two business returns to experience the Trial Balance/Books to Tax integration for free). ProAdvisors also can save 30 percent on all purchases on PTO tax returns. Both offers must be proactively redeemed by the ProAdvisors from within the ProAdvisors portal inside QBOA (See Discounts tab). QuickBooks Self-Employed. With QBSE, forget the “shoebox” of receipts and guesswork to organize your Schedule C clients’ tax information. Schedule C filers effortlessly track business-related income and expenses, while increasing their potential tax deductions. Key features include automatic mileage tracking that uses mobile GPS and other factors (with minimum battery usage) to automatically record trips with the date, starting location, ending location, total miles and potential tax deduction. Other features include “point and snap” receipt capture, simple transaction categorization to split business and personal expenses in a few swipes, and invoicing capabilities to get paid faster. In order to connect with your QBSE clients, they need to invite you from the gear menu, select “Accountant” and enter your email address. Once you accept the invitation, you can access your clients’ accounts through the QBOA client list to actively work, make changes, set rules or perform other actions. Note: Currently, clients can only add you into their QBSE, but soon, Intuit will include the ability to add a client through QBOA. Click here for more information on QBSE integration. Intuit is constantly responding to user feedback. For example, contextual invoice settings now let users change fields, columns and other settings from the invoice form itself. An option under the Gear menu allows users to easily see any attachments made at the customer or vendor levels. Several improvements were made to time tracking. For example, the table header is visible, even when scrolling and with a lot of entries. In addition, when adding a new row, the new row is now kept within the view. Previously, the table would scroll back to the top whenever a new entry row was added. Firm of the Future Blog – A topical news and feature resource for articles, white papers, infographics and more for accountant advisors, bookkeepers, firm owners, firm managers and tax professionals. Accountant University – Free, in-depth training on products, apps and how to grow. Accountant Resources – How-to articles and tutorials, answers, and support for QBOA. Accountants Help Hub – Tech support, FAQs and a forum for your product questions.